When the Vaidic mode of communion with the ultimate was in jeopardy, with the rejuvenation and reassertion of its wisdom being a pressing need, Adi Shankara strode like a majestic lion across the country taking all other lions in his stride and converted even die hards making them opt for the path illumined by Upanishads, such a powerful leader was needed at that time when Hinduism had been almost smothered within an enticing entanglements of atheistic views and consequently the Hindu Society came to be disunited and broken up into numberless sects and denominations each championing a different new point and engaged in mutual quarrels and endless argumentations. It was into such a chaotic intellectual atmosphere that Sri Shankara brought his life giving philosophy of non-dual Brahaman of the Upanishads. It can very well be understood what a colossal work it must have been for any one man to undertake in those days, when modern conveniences of mechanical transport and instruments of propaganda were unknown. In His missionary work of propagating the great philosophical truths of the Upanishads and rediscovering through them the true cultural basis of our nation, Acharya Shankara had a variety of efficient weapons in his resourceful armory. An exquisite thinker, a brilliant intellect, a personality scintillating super think tank with the vision of Truth, a heart throbbing with industrious faith and ardent desire to serve the nation, sweetly emotional and relentlessly logical, Adi Shankara was the fittest Spiritual General to champion the cause of Upanishads. 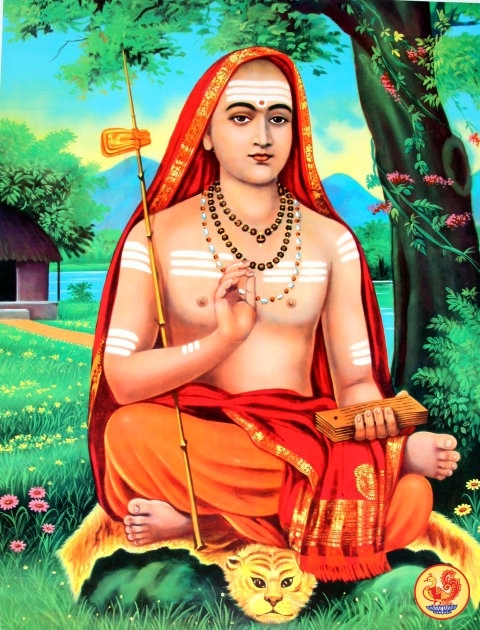 It was indeed a vast program that Shankara accomplished within the short span of 20 effective years for at the age of 32 he had finished his work and had folded up his manifestation. From masculine prose to feminine soft songs, from marching militant verses to dancing songful words, be in the halls of Upanishadic commentaries or in the temple of Brahmasutra expositions, in the theatre of his Bhagavad Gita discourses or in the open flowery fields of his devotional songs, His was a pen that danced to the rhythm of His heart and to the swing of His thoughts. But pen alone would not have won the war of culture for our country. He showed himself to be a great organizer, a far sighted diplomat courageous hero and a tireless servant of the country. This entry was posted in Biosketch, History, Nation and tagged Adi Shankaracharya, Vaidik Dharma on May 1, 2017 by arisebharat. I am deeply saddened that the 1000th Anniversary celebration of another great stalwart, Bhagavad Sri Ramanuja, is not mentioned in your publication. Ramanuja did more to reform temples and communities such that spirit of equality and cooperation spread among the varying tribes.